"Pass through the camp and say to the people "Get some food ready, because in three days you are going to cross the River Jordan to occupy the land that the LORD your God is giving you." We will come to Joshua's order later, but for today let's talk about the fact that Joshua didn't waste time in getting to work. One would think that he knew what to do from the get-go considering the way he went about calling the leaders together and telling them what to do almost immediately. When I read that verse I was like, "Lord, how did Joshua know what to do? how did Joshua know they were going to cross the river Jordan in three days? It was never mentioned in any of the verses." Joshua sounded so sure. He was so certain that God would give them the land. Joshua found the answer in the Book. 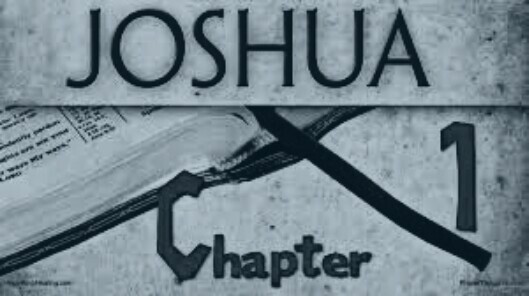 Behind the scenes (undisclosed in the verses), I am convinced that Joshua was gaining wisdom by staying close to God. He must had already memorized many of the words Moses had written down. He had to meet God. Only God would give him confidence (not self-confidence oh but God-confidence). Only God could lead him. 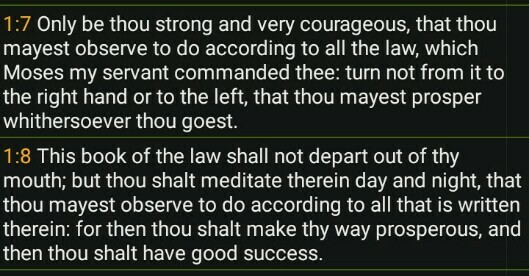 He had to meditate in God’s Word day and night. Are you looking for answers, help or direction? Get it in the Word. The word is all you need. One word is enough to get you moving. One word is enough to make you strong and bold. When God has given you responsibility for something, you need to carry it out. "I will never leave you!" "Do according to My word, I will make you prosper." Observe my word, you will succeed!